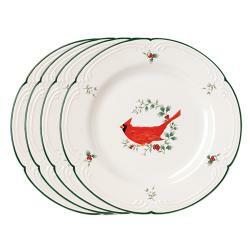 Today's Overstock scavenger hunt has me checking out dinnerware! For special occasion dining, I have a lovely set of Lavender Rose dinnerware by Royal Albert that was given to me by my grandmother over several years when I was growing up.. It's actually a lovely tradition - when I was twelve or thirteen, my grandmother took me to look at china patterns and let me choose my service - and then each year for my birthday and Christmas, I would get a place setting or completer piece, until I had service for 8 and a whole range of completer pieces! It was a great advantage when I got married, because I started out with such beautiful china that I wasn't worried or embarrassed to have dinner parties! What dinnerware do you like? Disclaimer: I am participating in a contest to win prizes from overstock.com and wrote this post as one of my entries.